Bring-your-own-seat. That's what it's all about with my latest project. Bart was kind of sad when I took apart "the sheep" as he lovingly called the ottoman I hastily made for our wedding last year. I've been hard at work this week and last to get some pieces ready to take to Flea Market Chics this Saturday. This will be my debut at the shop and I'm absolutely scrambling to get my projects done. I had high hopes for everything but due to the fact that it's been raining every day (or hailing as it did Sunday right after I rushed outside for a quick coat of paint because the day started off sunny). Despite the crappy weather, here are two of my completed projects. I will have more by Saturday, I promise. 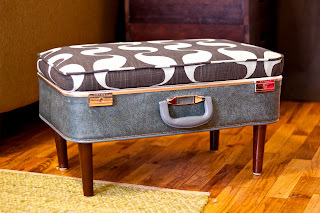 I'm pretty excited about the suitcase ottoman. I've seen these on the internet quite a bit lately and have been dying to make one. 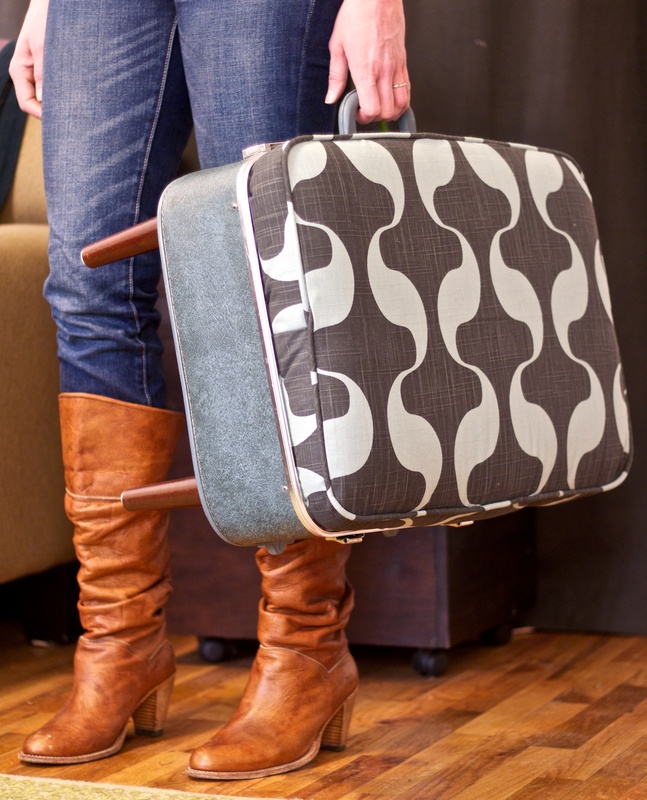 I'm in love with the retro print I found in the bolt ends at Hancock Fabrics, the legs of our beloved sheep, and this great turquoise suitcase. 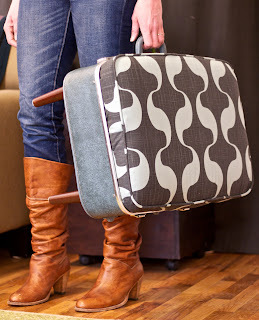 It was really quite easy to make and I plan on making a chair out of the smaller suitcase as soon as I can find an old school chair for the frame. Second project, and a biggie. I painted and distressed this antique sideboard I found on Craigslist. It was in good shape but needed a little love and some new hardware. I sanded the top down and stained it with a dark stain then painted the body of it turquoise, only to attack it with sandpaper hours later. 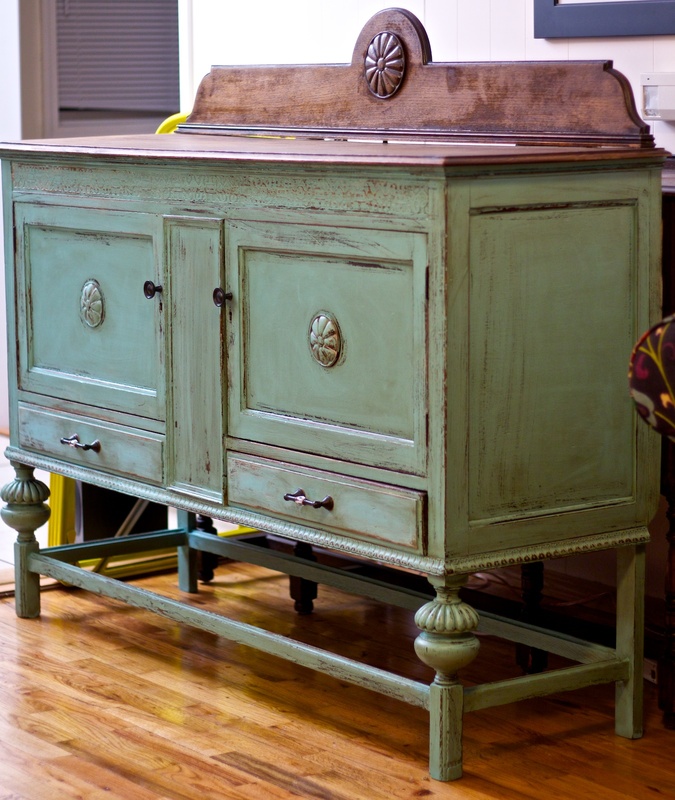 After distressing it, I put the dark stain over the turquoise and wiped it off to give it a more muted look. And here she is in all her glory. If Bart didn't have such an aversion to turquoise (perhaps because I love it so much and do EVERYTHING in turquoise) then I would have a hard time giving this baby up. I've got more projects in process that I hope to have finished. I've got several lamps I'm jazzing up with a little spraypaint and bright fabric lampshades, a kitchen table that is finished but needs re-assembling, a bench that just needs distressing and a cushion made for it, oh and about a billion other things. The list keeps growing. Gorgeous, Cydney! I'm glad you're showcasing your remarkable talent in this way. You never cease to amaze me. So inspiring! I can't wait to see the rest this weekend. Thanks for letting me tag along! Yes, I guess we are "those" pet owners.